Gluten-free spaghetti is fast, easy and delicious thanks to great gluten-free products. I used Tinkyáda Pasta Joy gluten-free brown rice spaghetti and Muir Glen organic tomato sauce in this recipe but use your favorite gluten-free products- there are many to choose from. * Cook gluten-free spaghetti according to package directions. Drain. Coat with olive oil. * Brown ground beef. Add spaghetti sauce and basil (optional). * Simmer sauce for about 15 minutes. 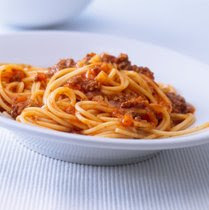 * Serve sauce over warm spaghetti sprinkled with fresh grated Parmesan cheese. Reminder: Always make sure your work surfaces, utensils, pans and tools are free of gluten. Always read product labels. Manufacturers can change product formulations without notice. When in doubt, do not buy or use a product before contacting the manufacturer for verification.